HOLLY POND – The Holly Pond Town Council held its regular meeting this week in front of a standing-room-only crowd at the Guy Hunt Library. Almost every seat was filled, and two walls of the library conference room were lined shoulder-to-shoulder, as the council welcomed two very different groups. 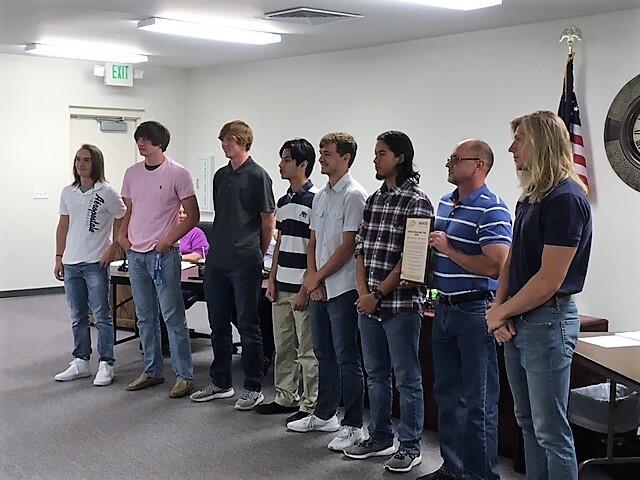 First up, Mayor Bill Oliver presented proclamations while the council presented plaques to the Holly Pond High School basketball and track teams, in recognition of their achievements this year. The basketball team made their way into the final four at the State 3A Championship tournament, while setting 17 new school basketball records. 4×200 relay team (Jarret Miller, Mason May, Dylan Morton, Todd Schwab) set a school record while winning the event at the state championship. Matt Cahoon set school records in high jump and shot put, while winning both events at the state championship. He also set the state 1A-3A record for high jump. While not placing first at the state championship, Jarret Miller (60m hurdles), Dylan Morton (400m, long jump), Todd Schwab (triple jump), Haley Higginbotham (60m hurdles) and Kirsten Campbell (high jump) set new school records in their events. As the student athletes left the meeting, the council began its meeting by opening the floor to public comment. First up was Rick Cason who, with his son, is opening a new business in Holly Pond. Quicksilver Diesel Repair and Welding is an automotive and truck repair and detailing service operating on Blountsville Road behind Harris Auto Repair. Cason invited the council to attend the shop’s ribbon cutting at 11 a.m. this coming Saturday. Next, representatives from the Holly Pond chapter of Bikers Against Child Abuse (BACA) came to speak. The group introduced itself as the only Alabama chapter of an organization operating in 49 states and several foreign countries, offering protection and encouragement to children who have been abused. Members stand guard outside the homes of abuse victims before their cases come to trial, and accompany them to court when necessary. One representative noted that children who feel like they are safe are able to function better, sleep better at night and are substantially more likely to appear in court to confront their abusers. While members have much of the intimidating appearance of a stereotypical biker gang, they assured the council that all members are required to pass a federal criminal background check, go through a year’s worth of training and have a good working relationship with local law enforcement agencies and courts in the areas where they work. As they got down to regular business, the council noted several expressions of gratitude from the community for the restriping of Cemetery Road. Also discussed was the need for repairs to a motor and rotor assembly at the town water plant. Michelle Bell, the parks and rec. chairperson, said that the park was ready for ball season which was to have started Monday night; but the heavy rains forced cancellation of all opening-night activities. Lou Thomas reported that positive feedback had been received on the town’s new welcome signs, but that landscaping still needed to be done around them. Under old business, the mayor presented a 30-page sewer ordinance proposal drawn up by Town Attorney Dan Willingham. The proposal received no action, being presented only for council review before the next meeting. Next, Oliver gave an update on Living Waters, the management company for the water plant, which has replaced its plant manager with an interim manager for unstated reasons. The plant was said to be in good shape, aside from the needed repairs to the rotor and motor, and has been found to be in compliance with all regulations. A motion was brought to floor to approve a “community fun day” at the town park, inviting crafters, local businesses, churches and civic groups to come out and set up. Wayne White, owner of The Middle of Nowhere antique shop, was put forth in the motion to head up the event. The motion passed unanimously. Consideration of a request for support from the library in its efforts to expand its hours was tabled, as no specific cost for the expansion had been presented and no library representative was present. Lastly, the mayor presented a proposed ordinance drawn up by Willingham to delineate the town limits. No action was taken, as the proposal was being put forth for a first reading before future discussion and action. Under new business, the council unanimously passed a single motion to give $200 to each of the town’s three schools to be used for prizes to be given to classes or groups from the schools participating in the PALS (People Against a Littered State) statewide cleanup on April 22. The principals of each school will determine the criteria for prizes, and will do the awarding of those prizes to the students of their respective schools. The council temporarily altered its regular meeting schedule due to a conflict, and will hold its next meeting on the first Tuesday of May at the Guy Hunt Library. The public is invited to attend.